To edit the properties of a control, you should first right click on a control in the design area to bring up its context menu. 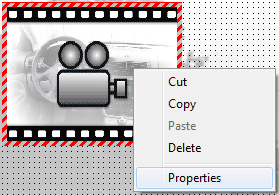 The ‘properties form’ can be accessed by clicking on ‘Properties’ in the context menu. Alternatively you can select a control in the design area and click the ‘Properties’ button in the toolbar to view or edit the properties of the selected control.